In the series Psychology of Everyday Life, published by Memefest and Faculty for Social sciences, University of Ljubljana, long awaited Memefest reader is out now. Edited and curated by Oliver Vodeb and Nikola Janović. 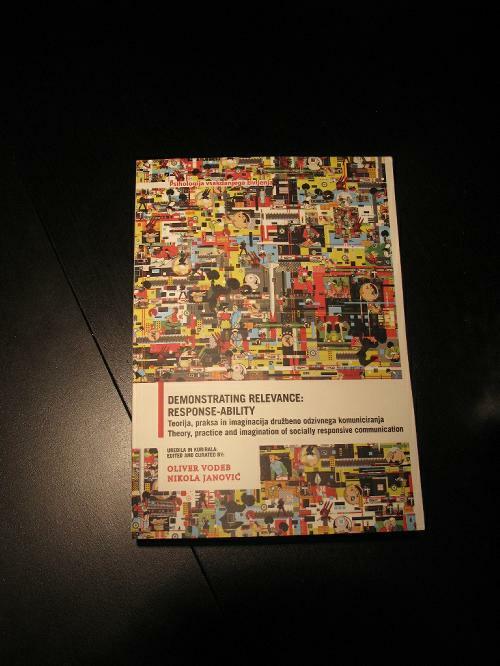 A collection of texts and visual material with the suggestive title DEMONSTRATING RELEVANCE: RESPONSE-ABILITY. Theory, practice and imagination of socially responsive communication -- edited and curated by Oliver Vodeb and Nikola Janović -- brings a different, fresh and radical interdisciplinary reflexive look at communications and media practices and theories. It contains textual and visual works that were created between 2002 and 2009 in the context of the International Festival of Radical Communication MEMEFEST and additional new reflections written in the end of 2010. Editorial and curatorial work was conducted in 2010. The collection of texts is constructive and responsible. With its uncompromising radical approach, it critically questions the ideology and practice of mainstream media-communication discourse. It is looking for theoretical and practical solutions where they are: in socio-responsible conceptualization. The collection of texts is not modeled after a template. It is unique, original and visually invaluable. It combines different visual perspectives and theoretical approaches that are indispensable for the field of social, cultural, media and communication, as well as design studies. A reflexive interlace of theory and practice. It is designed for anyone interested in new aspects of socio-critical thinking: professionals in the field of communication, communication educators with a social fibre, students in cultural, media and communication programs, students of design and art, as well as media activists. Book is in English and in Slovene language. This is a key text for anyone interested in socially responsive communication! 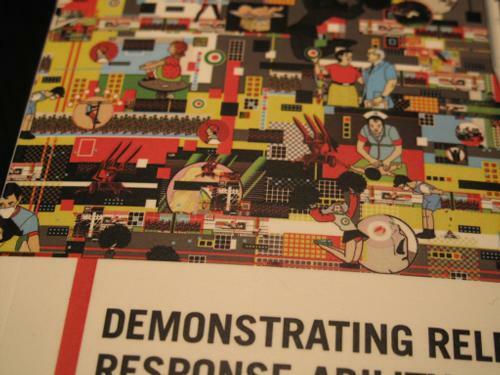 DEMONSTRATING RELEVANCE: RESPONSE-ABILITY is a collection of cutting edge essays, ultimate manifestos, theoretical debates and original visual works. Presented in all its heterogeneity, the content tangles between specificity, diversity, political (in) correctness, stylistic personality, poetry, theoretical rigour and more. Texts are arranged according to themes, so as to offer guidance through the issues the book raises. The aim of this book is to lead to an in-depth understanding of the communications, the media and the design culture of capitalism. It crystallizes original solutions as ‘good communication’ and broader reflexive communication action, education and research. The work reveals the pitfalls of marketing communication and its market-driven ideology. It reveals the mechanisms of quasi rebelliousness and quasi socially responsible advertising and design practices. It contributes an innovative reflection and analysis on the potential of the web – the gift economy – cyberspace, cyber conflicts and the high-tech economy. The heterogeneous content questions the role of design(ers) in advertising and design. One way it does that is by trying to demystify the ideological mechanisms and practices pulling the strings of everyday and ever-present advertising and design. The purpose of this work is not only to disclosure mechanisms, but also to raise awareness about dominant communication practices, which, more often than not, violate human rights and do not fulfill their duties and obligations properly. In its essence - the book argues - these mechanisms and practices are predatory and not socially responsible. By not being responsible, they fall short of offering responses to current (communication) problems. One more note should be added. Content of this book does not overlook the logic of cognitive capitalism and blind spots of communication disciplines. It highlights concerns some have with the scope of today's cultural and social critique. In the spirit of Memefest it further questions the possibility of establishing a new global ethical stance, radicalize questions about environmental awareness and opens pathways to a new subversive aesthetics of existence. The content’s common denominator demonstrates what other practices are not: its responsibility! DEMONSTRATING RELEVANCE: RESPONSE-ABILITY opens-up issues. It unlocks perspectives, practices and theories that are otherwise silenced by the established media and ignored by communication and design professionals and most of academia. We understand the reasons for that. We also see the consequences. That is why this collection of texts is necessary and important - it offers an analytical insight, conceptual apparatus and radical inspiration without which there would be no ‘good communication’ works, nor any emancipated spectators. We wanted to keep the price as low as possible. In the end the lowest price we could calculate is 34 EUR. It's a full color almost 600 pages book. Most of similar books cost over 60 EUR. If you buy this book online, shipping and handling will cost you additional 7 EUR. The book's weight is over 1 kg, this makes the postage very high: it's actually 13 EUR! So, we charge 50% of the actual cost. We can cover the rest because by selling it online we do not need to pay for any distribution.